I think I’ve found a leaf pattern that I like. Finally. 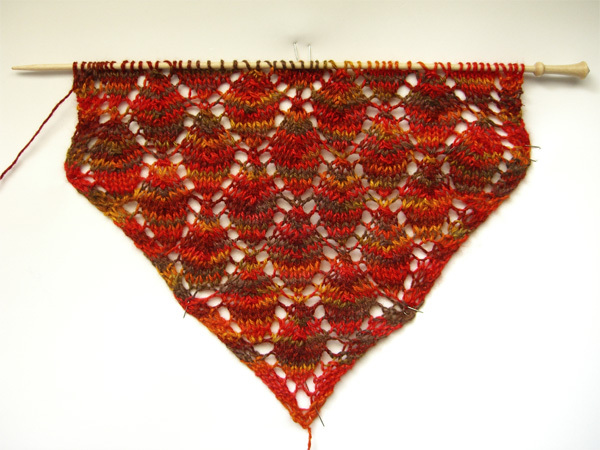 This is the Leaf pattern from Vogue Stitchionary: Knit & Purl. Pardon the pins, but it does need a bit of stretching into shape in order to photograph well. I had considered this stitch pattern originally. But when I swatched it, for some reason I thought there was an error in the instructions and I didn’t feel like dealing with it at the time. It may have come from knitting a square swatch. Or maybe from a tired brain trying to wrap itself around lace. At any rate, I discarded this in favor of other patterns that didn’t work out so well. After trying and discarding several more, I went back to this pattern and decided to give it one more try. This time, the pattern knit almost effortlessly. Perhaps it’s because I’m not knitting in a square, with 1/2-leaves on the sides. Or perhaps my brain is a little fresher. Or perhaps because, after swatching it before, I’m not following the instructions all that closely. In any case, I think I like the way this is knitting up. I tried it first with beads, but I didn’t like that look. The beadless version, I think, is better. The colors in the picture are fairly true. As always, clicking on the pic pops up the biggy size. With 400 yards of yarn, I should have enough to make a fairly long scarf. I debated whether I should knit this from the ends in to the center and then graft, or whether I should knit it end-to-end. Because the leaves are symmetrical, I think I will knit it end to end. The leaves will be falling on one side and rising on the other.